Many of our detractors do not understand why many of us go out and do these First Amendment Audits all throughout the country. Many argue that we are only going out there to entice these officers into a confrontation just to have video to upload to our YouTube channels for our 15 minutes of fame. I’m not going to disagree that there are probably some that do just that, but I believe that a majority of those that do these audits simply have a goal of either exposing those officers that do not know or obey the law; and to highlight those officers and departments that do recognize when a citizen is engaged in lawful activity. These audits serve to educate the public and law enforcement about our rights. I can truthfully say that instigating a confrontation with law enforcement is the furthest thing from my mind when doing an audit. My preference would be that these officers that swore oaths to “Support and defend the Constitution of the United States” would actually honor those oaths and simply ignore the camera and continue on doing their jobs. However, time and time again, these officers go out of their way to harass videographers that are engaged in perfectly legal activities. Despite this, they continue to approach these cameramen in an attempt to bully and harass. 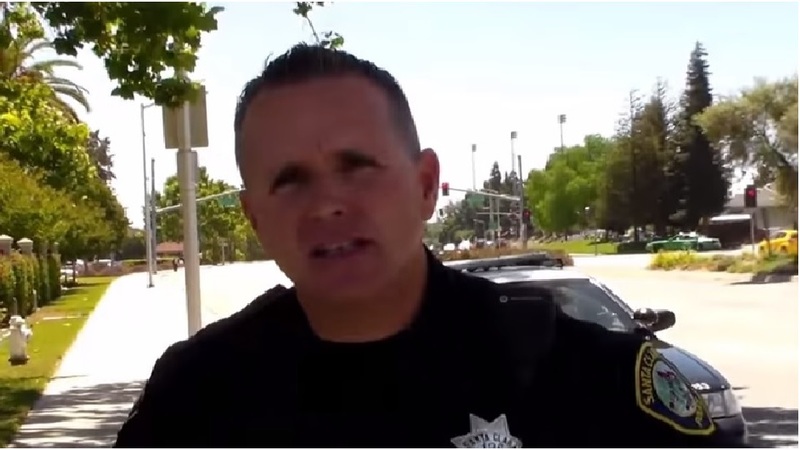 CopBlock33 of Cop Block Bay Area recently conducted a First Amendment Audit at the Santa Clara Police Department. The first 5 minutes or so of the video are uneventful, so skip to 5:25 when the officer makes the initial police contact. Officer Garcia, Badge #135, is the first officer to approach the cameraman. He never identifies himself before engaging the auditor and questioning him. These lines of questioning are employed as a tactic to frustrate and push the buttons of the person they are speaking with. The cameraman does good, so far, and continues to remain silent. Then a Sergeant arrives and Garcia begins telling the Sgt. that the cameraman may need medical assistance because he is shaky. As if it is not obvious that his shakiness is likely the result of armed men surrounding him on a public sidewalk, and asking him bizarre questions, even though he has done nothing wrong. 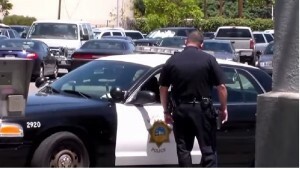 I will say that this was not a smart move as he just gave the officer false information. Even though he was not being detained, had these officers wanted to push the issue, they now had leverage to twist this interaction into an obstruction charge. My advice is to either remain silent or be truthful. After reading the paper, Sgt. Amos says, “Oh, you’re on of these guys. Ok.” Amos then goes on to give the same nonsense speech about how the cameraman should understand that, in this day and age, with all of these terrorist attacks and attacks on police officers, that he should understand why the officers were making contact with him. The officers acknowledge that he is not breaking any laws after he states that he has a First Amendment right to be on that public sidewalk filming. As far as I’m concerned, they pass the audit for acknowledging that fact. The issue that remains is their persistence in harassing this guy by questioning and lecturing him. Then another officer with badge number 10 arrives and takes some pictures of the cameraman, while the sergeant continues his speech about terrorism and such. Realizing they are not going to get anything from this guy, they pack up and leave him to his business. That’s not the end of it, though, as you will see in part 2 of the video. After the encounter in the first video, he is now approached by an officer wearing badge number 131. It seems that the bad cop approach and using intimidation tactics didn’t work so they send over another cop to play the good cop to see what kind of information they can get out of him. Badge 131 is extremely polite and friendly in the interaction, but you will soon see in the video that it is all a ruse. The cameraman explains that he has already been approached by officers and feels that they painted him as a terrorist. The “friendly” officer plays dumb and asks if he knows who the officer is. The camera pans back to the parking lot and you can see the Sgt. that the cameraman is referring to now sitting in his car and observing these events. The offi cer asks if he can see his video and the cameraman replies that he may not, but he can look it up on YouTube, and gives him the name of the channel. He then asks the officer if he has ever heard of CopBlock.org and the officer replies that he has not. Anyone with half a brain knows that this officer is lying through his teeth. The interaction ends and the friendly officer walks over to the car with the sergeant to tell him what he got from the cameraman. I believe that had the last officer approached the cameraman first, there may have been more of a willingness to maybe answer a few questions. The first officers set a negative tone right off the bat by showing up and being aggressive with their questioning and intimidation. The last officer also passed the audit seeing as he also acknowledged that there was nothing wrong with what the cameraman was doing. What can we learn from these two videos? First, remain silent. Let the officers ask their questions and waste their own time. By standing your ground and keeping quiet, they will, most of the time, realize that they are not going to get any info and leave you alone. If you say anything, it should be, “Am I being detained?” or “Am I free to go?” Remember, you are there to document how the officers react to your presence. By speaking you can inadvertently, and perhaps negatively, affect the outcome of the audit. Second, never give false information. By doing this, you open yourself up to being charged with obstruction. Identifying yourself as ‘John Doe’ is not a wise move. The cameraman might even have told the officers to address him as “Sir,” and that would have been legal and acceptable. The ultimate goal of these audits is to demonstrate whether or not these officers recognize that you are engaged in a legal activity and simply leave you alone. Currently many officers across the country too often feel the need to parade their authority over the citizens, and frequently cannot resist the urge to harass citizens, even when they are not breaking any laws. We need to be prepared with the understanding that we may be approached by law enforcement when engaging in these audits- and act accordingly. I do not advise going out to do these audits with the mindset of looking for an altercation with police. It’s both foolish and dangerous. Your goal should be to not have an interaction with the police at all. For more examples of how to do a First Amendment Audit effectively and professionally, check out Brett Sanders and Bunny Boots Ink on YouTube.